Cricket21 helps you analyze the complete performance of the teams, by breaking down all the entities of a game. We analyze, taking into consideration the past performances of the team. The coaching staff is offered relevant data, and then we go on and assist them in setting targets for the team and individuals, and track their progress. Breakdown of the different innings played by a Batsman: type of strokes, type of dismissals, Individual percentage of all scoring shots, and percentage of runs scored on offside/legside. Extensive study of the Batsman's performance against a particular bowler, specific style of bowling, particular type of delivery. 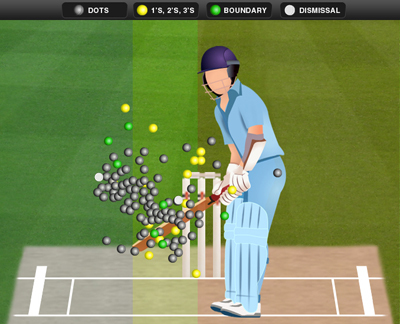 Complete overview of the usage of slow balls, yorkers & bouncers. Detail report of strengths and weaknesses.